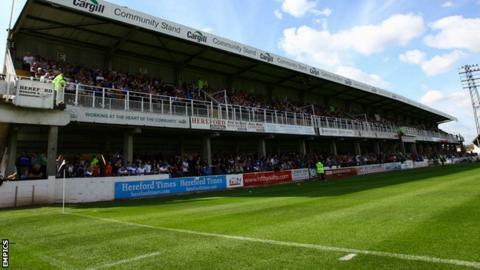 Hereford United have been suspended "from all football activity" by the Football Association. The club have "failed to comply" with a deadline to answer questions posed by the Independent Regulatory Commission's owners' and directors' test. Having initially submitted documents, they were requested to send "further documentation" by Monday. But they failed to meet that deadline, also resulting in the suspension of majority shareholder Alan McCarthy. Bulls chairman Andy Lonsdale told BBC Hereford & Worcester on Wednesday that he is set to take over as majority shareholder at Edgar Street. He has confirmed that the club's previous owners - Alpha Choice Finance - are to transfer their majority shareholding to Lonsdale, who has promised a £1m investment in the club. 1972 - Elected to Football League at the end of the season in which they secured their famous 2-1 FA Cup third-round replay win over Newcastle. 1973 - Promoted to Division Three, followed by a further promotion to Division Two in 1976. 1977 - Relegated to Division Three after just one season, followed by a second relegation back to Division Four a year later. 1997 - Relegated to the Conference after 35 years as a Football League club - two years after Graham Turner's appointment as manager. 2006 - Promoted back to the Football League under Turner, who then leads the Bulls to promotion again in 2008. 2012 - Relegated back to the Conference, finishing sixth in their first season under Martin Foyle, despite the onset of their current financial problems. 2014 - Hereford are expelled by the Conference in June, over non-payment of debts. They are also served with a winding-up order by various creditors, led by Revenue & Customs and former manager Foyle. "Having failed to provide the requested further documentation by the deadline, both Hereford United and Mr McCarthy shall remain suspended until such time as the order of the Independent Regulatory Commission has been complied with to the satisfaction of the Commission," an FA statement read. "The FA understands the importance of football clubs to their local communities and will continue to work with all relevant parties to ensure senior football returns to Hereford at the earliest opportunity." Hereford, relegated from the Football League in 2012 before being expelled from the Conference in June following non-payment of debts, stand 15th in the Southern League Premier Division. They were set to visit Dunstable Town on Saturday. The club are expected to return to the Royal Courts of Justice on Monday, 15 December to contest their winding-up order. The hearing has already been adjourned eight times since June.